Next you have to upload your file, duh. 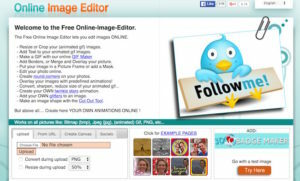 Once uploaded it is as easy as adding your text over top of the animated gif, saving your creation and you are all set. So what if you want to add caption, but above or below it and not on the animated gif itself. To do that you can follow these steps. Instead of uploading your gif image as the first step, select ‘create canvas’ in the bottom left on homepage. If you are already in the application select upload image to make a new canvas. When choosing a size you want to create a width that is the same width as your animated gif, BUT you want to make sure the height is set to a greater amount. Now that the new canvas is open, click wizard then choose overlay image to add your animated gif to the canvas. Position it how you like and add you text to the extra space you created. NOw save and you are finished making your own captioned animated gif.